I wasnt too excited about this Take Ten challenge at first..I was worried that the sandy coloured spots would wash me out and make me look ill..or worse dead..but when I received this dress in the post courtesy of Peacocks by Design and slipped it on and looked in the mirror I was deeeelighted! It fitted like a dream, the colour seems to work well with my skin tone mixed with ivory and the pleated chiffon skirt was bang on trend.. I kept the styling simple and girly..
open toe flats and ankle socks..check.. 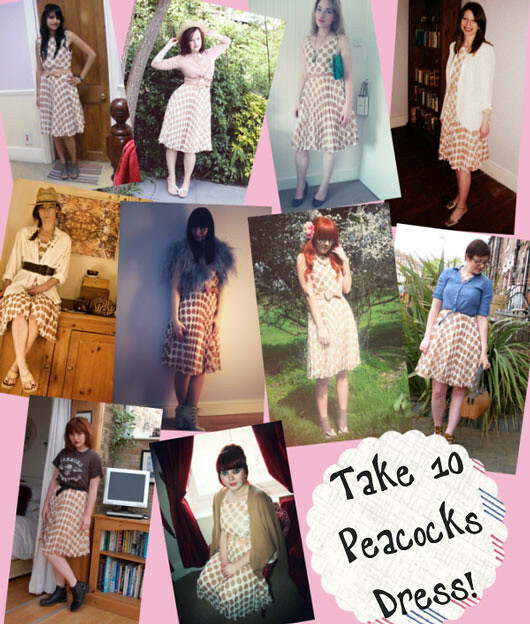 Here is how the other lovely Take Ten ladies styled their dresses: so many good ideas of toher ways to wear it! Be sure to check them out: Jen, Mj, Ellie, Sabine, Sarah, Sherin Paula, Harriet and a special thank you to Susie for stepping in for this challenge as sadly Adele has decided to leave. So what do you guys think? Who styled it the best in your opinion? You look absolutely beautiful - so so classy and ladylike. I love the locations in these photos too! Your butterfly flats are delightful too. I love your outfit! This is what i really like, vintage-dreamy look! you look great! Isn't it funny that you all seemed quite wary of this one and you all look absolutely stunning in it? It's something that doesn't need too much styling IMO, but I love all the different tweaks and accessories that you've all tried out with it. That dress screams cuteness! Really like the way you styled it, as well as the ones in #1 and #5. I love the way you styled the dress! 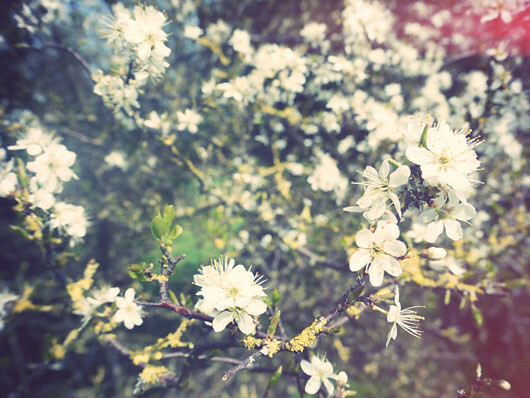 It makes me happy to see spring is flourishing everywhere:) hehe.. I LOVE this dress, it has my name written all over it! I love the little bow on the front. Its so girly and lovely! You look amazing in it, love the flower in your hair! I am totally in love with this outfit! It's so cute! I myself would change the shoes and socks with wedges. But that's just me. I am in love with this look, it's so cute! the dress is so cute. i really love the ribbon detail on the belt. This looks totally adorable on you. I love the way you've styled the dress. I especially love your shoes - so darling! That dress is really pretty. I like the ankle socks and shoes together. 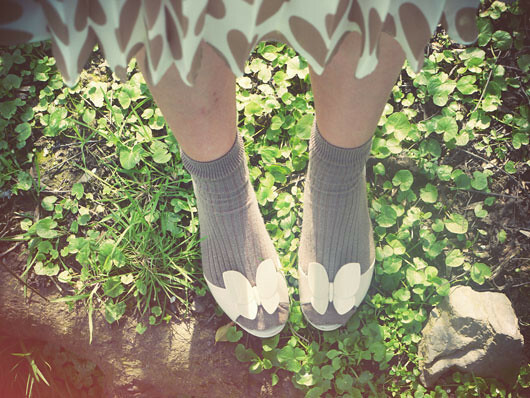 I adore how you styled this dress, especially with the socks and shoes--such a cute idea! I really love how you captured the movement of the fabric in the first photo too--it is such a fun flowy dress for spring, isn't it! I absolutely love how girly and pretty this dress was. The flower in your hair goes perfectly with the dress. 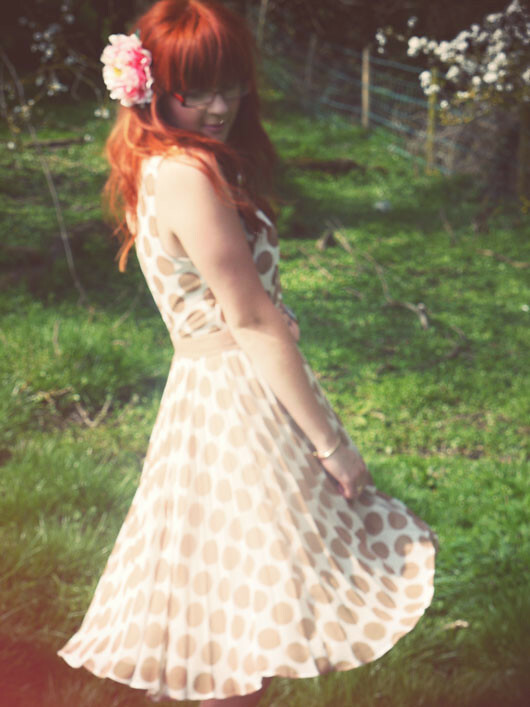 I absoluely love the fun summery way you've worn the dress! The shoes are such a perfect addition too. Wow, that dress is so gorgeous on you...you styled it perfectly! Awwh ur style is the best ! that dress really suits you <3 and oh oh those pictures are fab ! The socks are the perfect touch, Vicki. Lovely! Beautiful dress and absolutely lovely accessories. 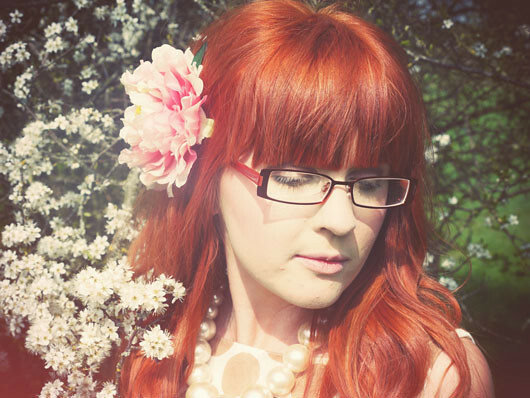 The pearls, the butterfly flats and the flowers, both in your hair and in the background... Dreamy! Very pretty. I'm really quite jealous of your shoes! The pictures make me nostalgic for the warm weather, though. Where did it go? aw so nice! love your hair and you're gorgeous! xo. Those shoes are AMAZE! I always say it but beautiful pictures as usual Vicki. Everyone looks really lovely. Your hair looks so beautiful with the dress and I love how you styled it. You used the perfect accessories! What is this Take Ten thing (I'm a regular reader but still relatively new!!)? I love this! I love the bow and the pleated skirt, so pretty. You look amazing in these pictures! This outfit has a very vintage / romantic feel to it, love it! um, hello stunning woman!!! this is amazing! Oh the dress looks adorable on you, it looks awesome with your hair colour too, it kind of livens it up! This dress is so beautiful, I absolutely love it! You look so lovely. hey Vicki, thanks for visiting the other day and your sweet comment! i have to say i really dig your header and button designs, nice with the background color too. Wow, this dress looks amazing on you! I can't get over how beautiful your hair is!!! Thank you so much for visiting my blog and for your lovely comment!!! I love the girly style of this dress, and although it isn't something that I would wear myself, I think it screams classic lady wear. Beautiful! Adorable :) The dress looks great on you and I love how you styled it! Must agree with all of the above, totally love the way you've styled this. If I'd seen it on a hanger, wouldn't have thought it could look this lovely! 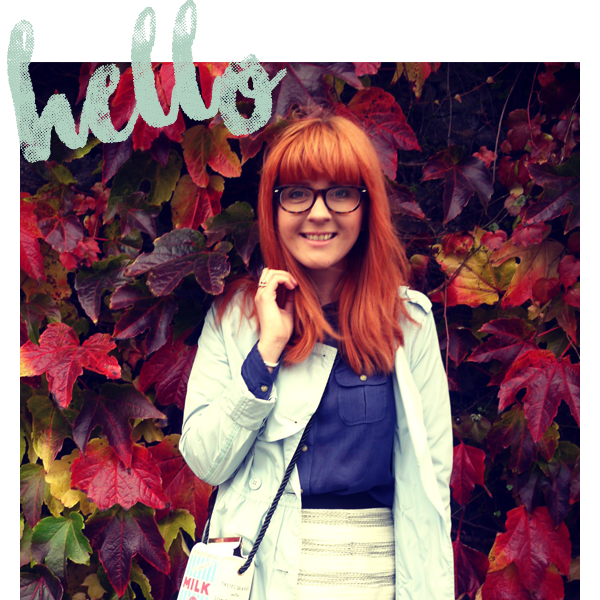 I think ankle socks make everything ok these days :) Just stumbled across your blog now, so lovely. Also, I adore your hair! I was deliberating going that colour for so long, but didn't want to interfere with my natural colour, which is a lighter red than that. 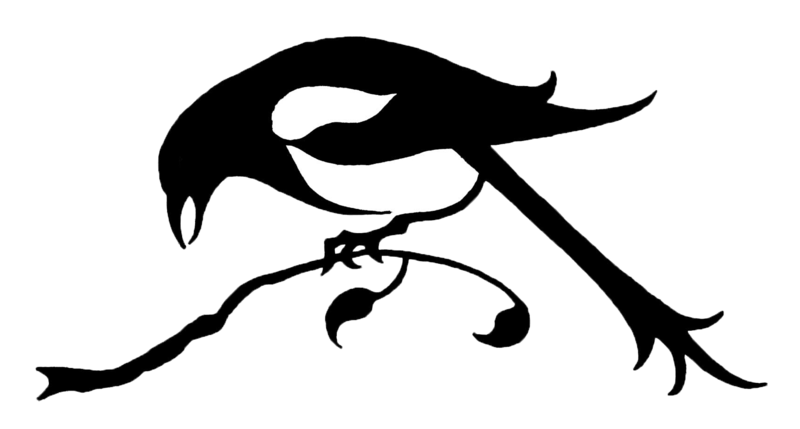 So yes, wonderful blog. cute dress! You're a doll!